Mrs. Dueckman and her Grade 9 Geography class. 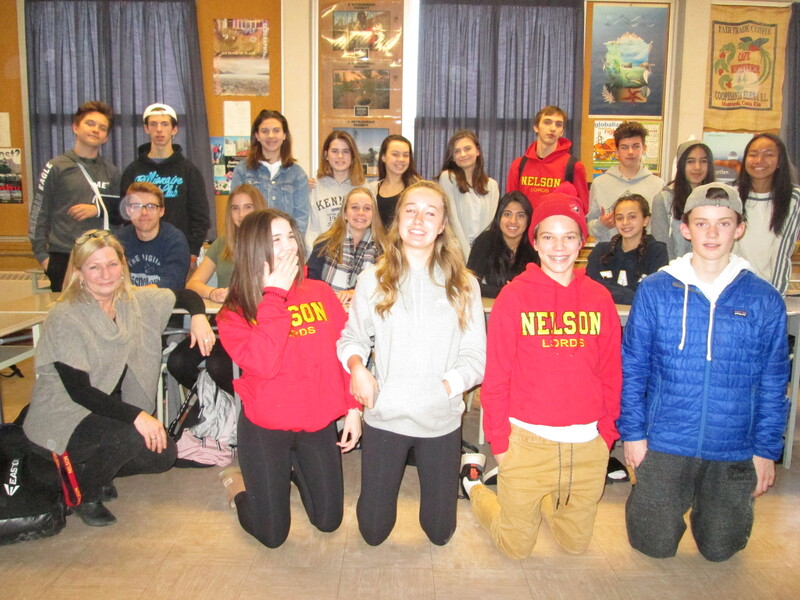 Last fall, Nelson became the third high school in Burlington after Aldershot and Hayden to participate in the People and Places in Halton (P2H) program. P2H is a partnership between the individual high school, the City of Burlington and the Halton Region Health Department where a series of guest presenters are invited to engage students throughout the term on a particular theme, such as sustainable development, food systems and transportation. Students at Nelson were also taught the concept of an 8 80 city, where planning for streets and public spaces consider the needs of both an eight year old and an 80 year old. Students were asked to write a report on a local sustainable initiative that could be implemented to help make Burlington a thriving and vibrant 8 80 city. Mr. Papadopoulos, his Grade 9 class and guests. Plant a community food garden on school property to encourage active and healthy lifestyles for students. The food could then be used for the Grade 10 food course. 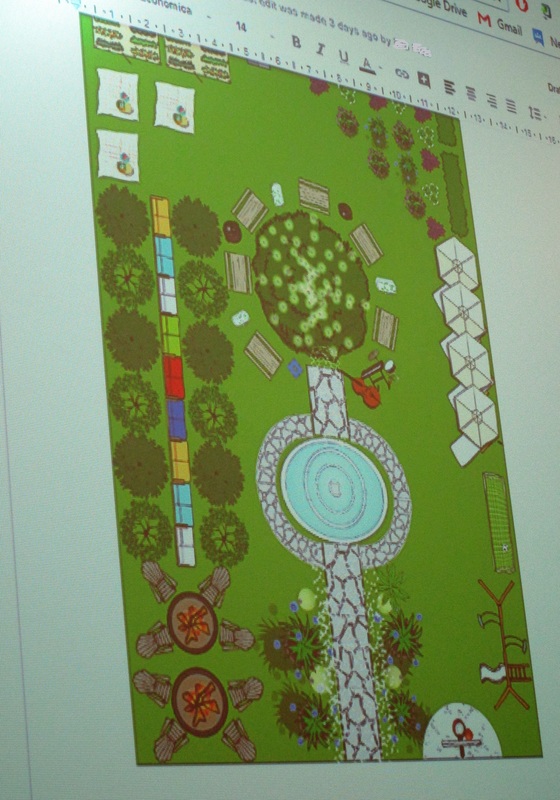 A rooftop garden was also suggested by another student. Incorporate a plant wall at the school similar to what the class saw on their field trip to the University of Toronto. This will help provide a calming influence for students. Include a car free accessible zone with tables and benches on the school property where students can study and hang out with friends in a sunny, welcoming environment. Repurpose Robert Bateman High School into a recreation centre like the YMCA, or Haber or Tansley Woods community centres. Bateman already has a lot of amenities such as a pool, gym, library, workout room and outdoor track. Add a playground and basketball court at Roseland Park so that entire families can be active with parents in the nearby tennis facility and their children at the proposed playground. Improve Nelson Park with a pond similar to the one at Spencer Smith Park. Add a dog park at Breckon Park as there are currently no such facilities in the area. Redesign a section of Spencer Smith Park with a seating area. (Note: Since this area is already heavily used by events throughout the summer, guests suggested that this could be something to consider in another area). A Nelson High School student proposed this design for a section of Spencer Smith Park. Add benches all around Roseland to encourage people of all ages to walk around their neighbourhood. Add an art installation at the Brant Street Pier. Establish a bike share program like Toronto or Hamilton has at Spencer Smith Park. Install an electric vehicle charging station at Appleby Line and Harvester Road. Create a room or library with donated instruments that people can use or sign out. Guests were quite impressed by the students’ efforts into these projects and there were many interactive discussions with suggestions made by guests for consideration. Perhaps one or more of the suggestions will be implemented in the future. Take Action Burlington! Ongoing programs such as these between the city, schools and the community at large help to build a more liveable, sustainable and healthy community for everyone – including youth! Collectively, we can make a difference.